Make toast infused simple syrup the day before by combining 50/50 sugar and water and letting it infuse with dark toast for 2-3 hours, then strain and refrigerate. Cut bread into points and begin toasting. Combine whiskey, lemon juice and simple syrup in shaker with ice. Shake hard and strain into an ice-filled rocks glass. Place half an avocado in bowl, top with 0.5 oz GRAND HOPS amaro and muddle until semi chunky. Spoon muddled avocado on top of drink. Sprinkle chili and sea salt on top then garnish with toast points. Melkon created this simple avocado toast cocktail today and, after a thorough round of tasting, we all agree it’s spectacular. The whiskey sour ‘toast’ base is warming and clean to counteract the delicious chunky avocado topping. We all immediately wanted to dip the garnish and the salt / chili flakes made the whole experience echo our favorite brunch dish in the best way! Even better, we fully believe anyone can make this at home. Here at the distillery, we’ve always been fans creating (and drinking) savory cocktails. While most people are onboard with using fresh herbs and produce for garnishes, we’re firm believers in incorporating the whole produce section into our cocktails. Our mixology team have had success with beets, radishes, bell peppers and even kale. 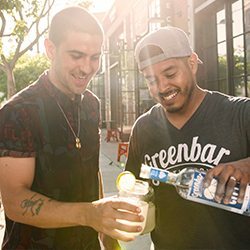 If you want to explore more savory flavors and mix up your own food-driven cocktail then sign up for a cocktail class where you’ll have access to locally-grown produce and guidance from our mixology team.